Boasting more gags per minute than any other movie, our brand new Airplane! inspired movie tee comes to our online shores. 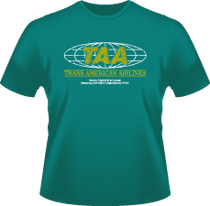 Trans American Airlines is the fictional airline that Airplane! flew with. Nerdoh have also included 'Otto' the blow-up automatic pilot which featured heavily in the film. White and green distressed print on a Jade, super premium heavy cotton t-shirt gives a very classy, cool yet subtle look. So if you are a fan of this cult movie, check out our new design.